The model code is getting updated. There may be delays in forecasts. Meteogreen is a real-time short range numerical weather prediction system run by Dr. Abdullah Kahraman since 2007. 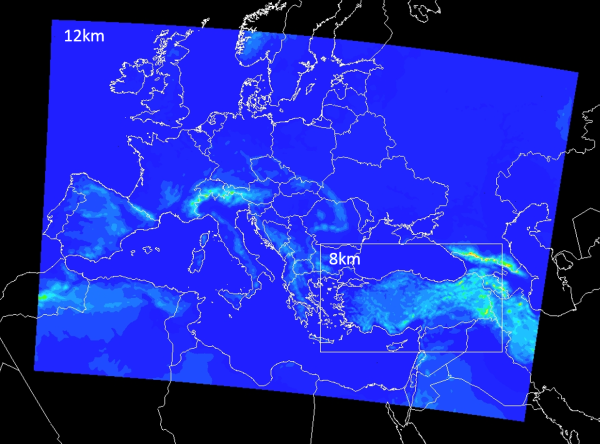 The base model used is WRF-ARW, which is tuned to provide the best operational forecast for Turkey and environments, after hundreds of sensitivity tests. The European domain (Euro&Med) with 12 km horizontal grid intervals has a forecast range of 72 hours. Türkiye domain with 8 km horizontal grid intervals has 10 days forecast range. Send an email to meteogreen[at]meteogreen.com (replace [at] with @) for more information. You can also contact me via Twitter (twitter.com/meteogreen) or Facebook (facebook.com/meteogreen). Non-commercial usage of the products is free. The forecasts are published "as is", and come with absolutely no warranty. Last update of the charts of Europe & Mediterranean domain was on 2019-04-23 Tuesday, 22:04:54 UTC, and Turkey domain on 2019-04-24 Wednesday, 03:43:34 UTC.